Very long and Very slow, the TOG II is one of the most popular and easily recognizable vehicles in World of Tanks. Despite its bulky appearance, it's not an unstoppable behemoth and instead derives its strength from its 1,400 hit points and fantastic gun. 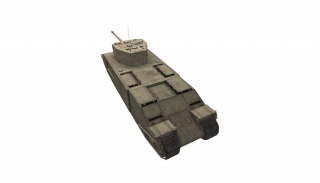 The huge hit point pool and powerful, fast firing 17-pounder gun make it ideal as a base defense tank. With proper positioning and hit point rationing, it can swing seemingly hopeless situations in its favor and win the battle for its team. 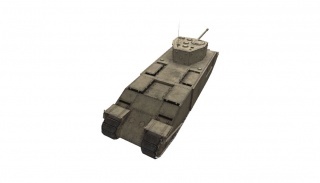 The TOG II is a heavy tank that plays like no other heavy at any tier. It has a 14 km/h top speed which is slow even for a heavy. With only 76 mm of armor, it's a heavy tank in name only. It is one of the longest tanks in the game, so long that it can even be used to block off roads and bridges in desperate situations. In place of strong armor, instead it gets an incredible amount of hit points. With 1,400 hit points, it has more than any tier VI tank. It is also capable of hitting back with a powerful 17-pounder gun. This fast firing and accurate gun can quickly evaporate enemy tank's health pools at any range and is more than capable of perma-tracking enemies. Incapable of brawling in the same sense as other heavy tanks are, it can not lead or take part in an advance due to its slow speed. Instead, it typically engages targets by trading hit points with them. This is best done against targets who are already weakened, and thus properly positioned, is a very formidable late game tank after both teams have lost most of their hit points. Its huge hit point pool and fast firing gun enable it to take on multiple lower health targets simultaneously and win. In this way it can completely turn a bad game around for its team. Due to its slow speed, armor that is more that of a medium tank, but excellent gun and massive hit points, the TOG II by default is not an attacking tank but more of a base defense tank, at which it greatly excels. Any enemy tanks that break through the front lines and approach the base circle area are usually damaged and have their hit points whittled down, when suddenly they are confronted with a TOG II with its full 1,400 hit points and fast firing, incinerating gun! The end for the approaching enemy tanks is almost always certain and this is where the TOG II really shines. The TOG II also rakes in huge quantities of silver coins and XP. It's not a race car, but all in all, played properly, the TOG II has a lot going for it. At the beginning of World War II (September 1939) some military officers and engineers thought that the new war would evolve in the same way as the First World War. The war would be static, with the opposing armies occupying two lines of trenches running from the North Sea coast to the Swiss border, separated by a ‘no mans land’ swept by artillery and machine gun fire. Sir Albert Stern, Secretary of the Landships Committee during the First World War, believed that the sort of tanks being produced in 1939 would not be able to cope with these conditions. In company with other engineers involved in tank design in 1916, including Sir Eustace Tennyson D’Eyncourt (Former Director of Naval Construction), Sir Ernest Swinton and Walter Wilson, Stern was asked by the War Office to design a heavy tank using World War One principles. The group was called officially called ‘The Special Vehicle Development Committee of the Ministry of Supply’; unofficially it was known as the TOG committee (TOG: The Old Gang). It began work in September 1939. The first design resembled an enlarged World War I tank with a Matilda II turret on top and a French 75mm gun mounted in the front plate of the hull. Fosters of Lincoln built a single prototype and trials started in October 1940. It was powered by a Paxman-Ricardo diesel engine and had an electric final drive. The electric drive burnt out and was replaced by a hydraulic drive; this also failed and the vehicle was scrapped. In the meantime the committee was designing a larger vehicle of great size, the TOG II. Its most original feature was the diesel electric transmission where the V12 diesel engine drove two electric generators, which powered two electric motors, which drove the tracks. There was no gearbox or mechanical transmission. (Ferdinand Porsche installed a similar system in one of his unsuccessful prototypes built for the German Army.) The tracks, after passing around the front mounted idler dropped down below floor level to create more internal space, an idea thought to be unique to this tank. 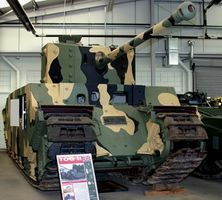 Fosters completed the single TOG II prototype in March 1941. It was so heavy that it was only possible to weigh half the vehicle at a time. The design specified machine gun sponsons on each side where the side doors are, like a British World War I tank. These were quickly abandoned. 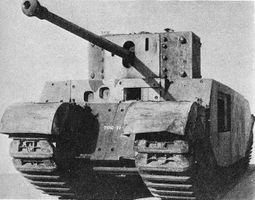 The tank was fitted with four different gun turrets between 1941 and 1944, ending up with the type of turret designed by Stoddart and Pitt for the A30 Challenger Heavy Cruiser Tank. This mounted a 17pdr gun, making the tank a TOG II*. 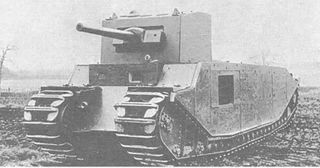 The TOG II’s great length made it very difficult to steer and combined with its weight and low power weight ratio (7.5hp/ton) made the tank cumbersome and unwieldy.In reality ‘The Old Gang’s’ ideas were wrong; tanks needed to be smaller, agile and more mobile. 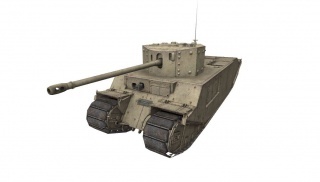 The TOG II was finally abandoned in 1944, although the A22 Churchill had been adopted as Britain’s standard heavy infantry tank long before. 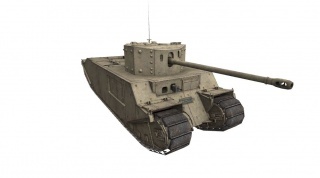 According to original design, A completed version of TOG II will mounting a side sponson cannon (same design as British WW1 tanks) on "Window" area of the TOG II in game, But since TOG II project were cancelled, a "Window" still uncovered until today, But it was covered in game. This page was last modified on 29 March 2018, at 19:38. This page has been accessed 322,888 times.